Kinda Eclectic … I had this stamp set on my wishlist for quite a while… borrowed my uplines for a specific project… realised I really did N-E-E-D it… bought it… then got side tracked! So, I was super excited this week when I had the perfect opportunity to open it up and put it to its maiden use. I teamed up with Gorgeous Grunge & Petite Petals for a much more rustic card than my usual style. Love this stamp set! Thanks Anne. It’s a really sweet set, and as it was an all attendee giveaway at Convention this year, there are heaps of samples / inspiration on the net. Gorgeous card Kelly, love it. Kelly, this is beautiful. I LOVE the vibrant pink flowers against the soft blue backdrop. Thanks for joining in the fun at Just Add Ink this week! 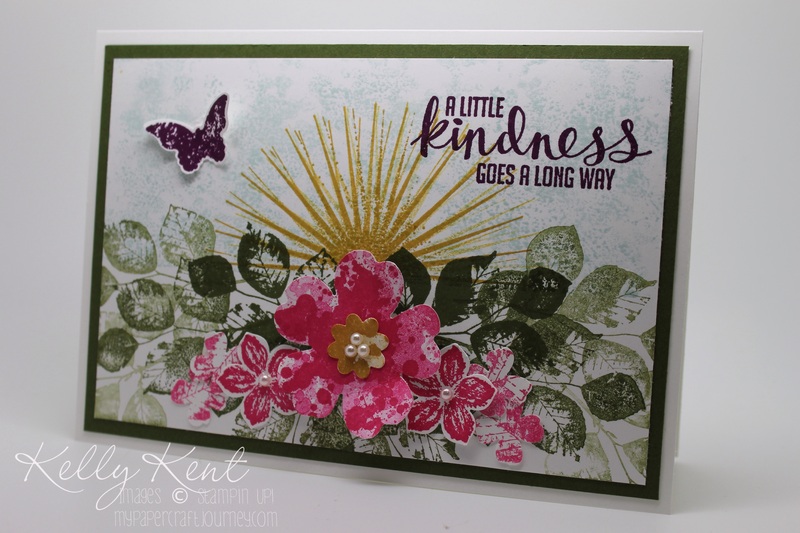 Kelly I love the soft atmospheric stamping you used for this card it is very pretty. Great idea to stamp your block with the Grunge stamps too! Thanks for joining us at Just Add Ink this week.